Ronald Dion DeSantis (born September 14, 1978) is an American politician, former Navy lawyer, and author. 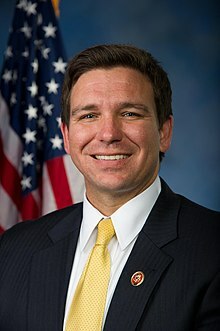 DeSantis is the 46th and current Governor of Florida. He was the U.S. Representative for Florida's 6th congressional district from 2013 to 2018. He is a member of the Republican Party. He ran in Florida's 2016 U.S. Senate election until incumbent Senator Marco Rubio's announcement that he would seek reelection to the Senate. DeSantis officially announced his candidacy for Governor on January 5, 2018, and was endorsed by President Donald Trump. In August 2018, DeSantis won the Republican nomination and defeated Democrat Andrew Gillum in the general election in November 2018. ↑ DeBonis, Mike; O'Keefe, Ed; Sullivan, Sean (June 22, 2016). "Marco Rubio will seek Senate reelection, reversing pledge not to run". The Washington Post. Retrieved December 22, 2017. ↑ Gancarski, A.G. (June 22, 2016). "Reports: Ron DeSantis to run for re-election in CD 6". Florida Politics. Retrieved December 22, 2017. ↑ "DeSantis makes it official, enters governor's race". This page was last changed on 8 January 2019, at 07:38.